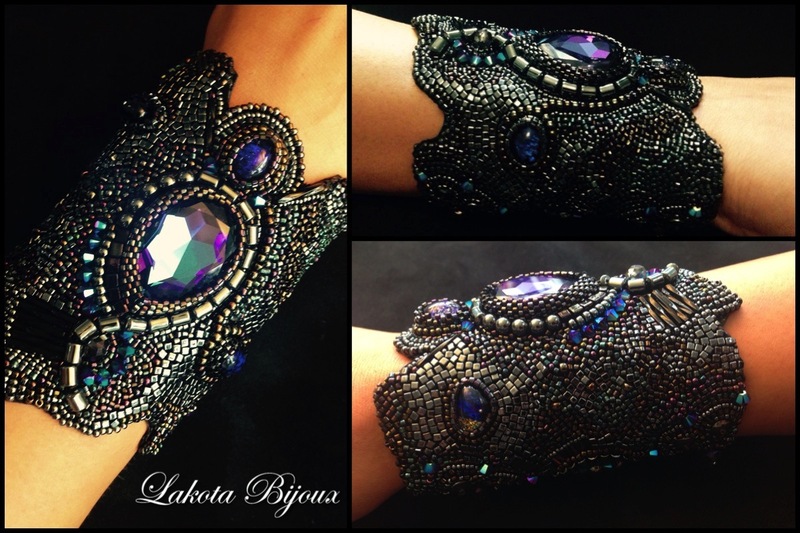 This week’s feature is beaded cuff maker, Lakota Bijoux. 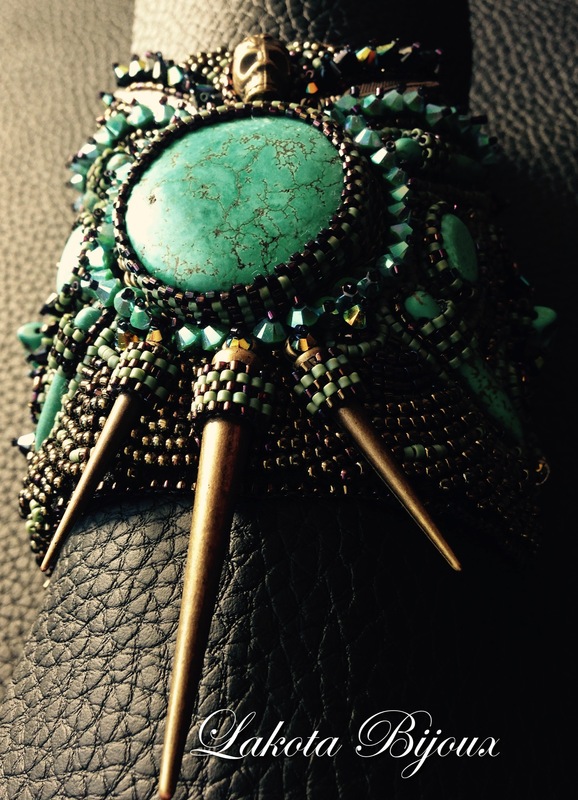 A relative newcomer to the jewellery scene, this is certainly one to watch. Follow her on instagram and facebook. 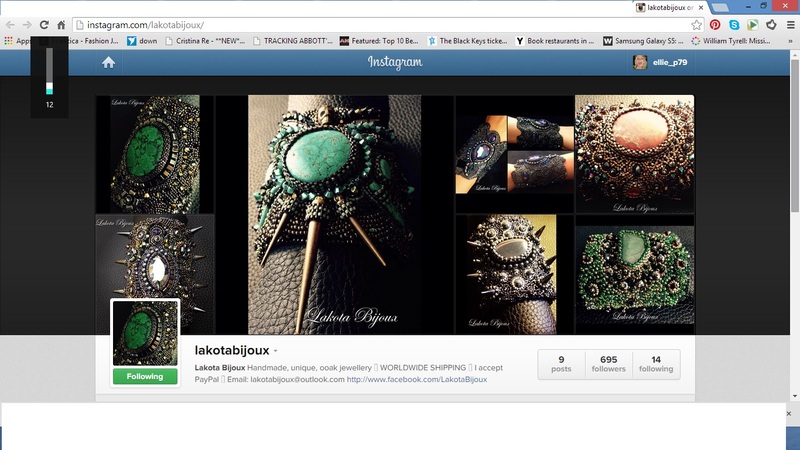 Who is the person behind Lakota Bijoux? Where does the name Lakota Bijoux come from? Lakota is my name and ‘bijoux’ means jewellery in French. Do you have any formal jewellery training? None at all. Everything I know, I have learnt along the way. I have always loved making things by hand and LOVE accessories. As a hobby, I started off making headbands and hairpieces with feathers, and then used the same concept for earrings and necklaces. These were very popular at music festivals, and a few shops ended up buying all my stock. Then in 2009, I was in Israel and chanced upon an area full of craft shops, basically Lakota heaven. In one of these shops, I found a beautiful book full of the most amazing bead embroidery jewellery. I had never seen anything like it and became completely obsessed. I ended up visiting that area every day and bought so many beads, big beads, small beads, gemstones, crystals, but I had no real idea of what to do with any of them. I started putting beads to fabric anyway, learning as I went along. If there was a technique that I wanted to learn, I would go to Youtube or buy a tutorial online and do it over and over until I mastered it. The first few pieces I made were just for me and I had no intention of selling at all. But every time I would wear one of my cuffs, friends, and complete strangers would ask me where they could buy it, often offering me money to take it on the spot. It was only this year that I started making pieces to sell. I have been in the planning/experimental stages for a few months and launched one month ago so it is still in its very early stages. From the beads themselves. I just start working and ideas come to me. My best work happens when I have no outside distractions and am able to become completely immersed in what I am doing. I am also lucky enough to have an insanely talented group of family and friends whom I can bounce ideas off and whose opinions I trust implicitly. 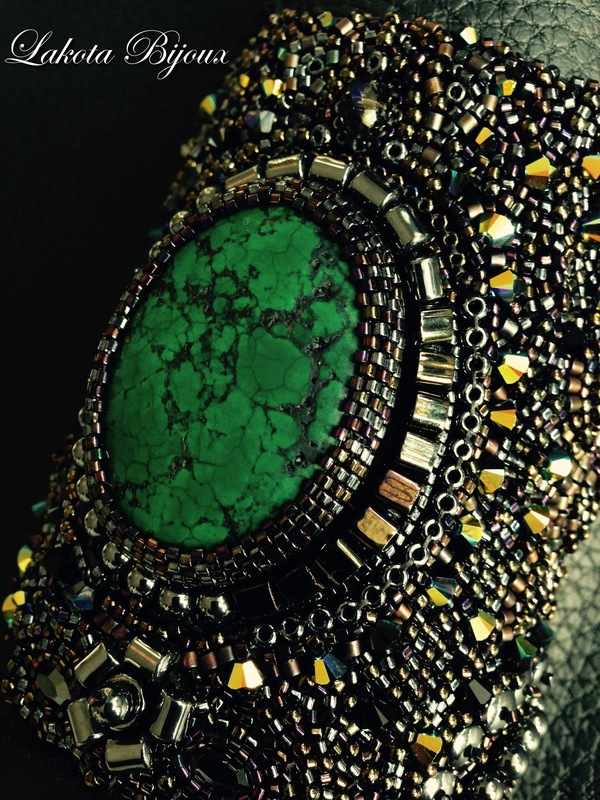 I saw on facebook that you had purchased a green stone from a museum but didn’t know what to do with it and later turned it into the central detail on a beautiful cuff. Do you often purchase stones and beads without knowing what you will do with them at the time? Yes. I don’t do it intentionally, but that is actually that is how all my pieces start. I just love using gemstones and minerals and find beautiful stones (or should I say they find me) everywhere: museums, craft stores, exhibitions, flea markets, even the Organic Store. I am a complete beadaholic and if something catches my eye, it will absolutely come home with me for use at a later date. Swarovski crystals are my weakness and the colours, shapes and sizes of their Elements range are forever dazzling me. I buy them by the hundreds with no particular piece in mind. Do you make all of the pieces yourself? What is the process from idea to finished product? Yes, everything from start to finish. I start off with the focal stone, and then I think about what smaller beads will go with it. I never design or draw anything in advance, I just let the beads tell me where to go and I am constantly learning and acquiring new bits of knowledge. I often work on 4-5 pieces at one time and my workspace is forever increasing. Beads are stitched, one by one, on to a felt or suede like base. When the embroidery part is finished, this is then attached to a soft leather or suede backing. It can take up to 30 hours hours to complete one piece. Wearability and comfort is the most important thing to me and I want my pieces to fit the wearer as though it was made especially for them. For this reason, many pieces remain unfinished until they are bought, and then the clasps are added according to the measurements of the buyer. I like to post pictures on my Facebook page which show my progress with each piece as I go along. With custom pieces, I work together with the customer, using both their ideas and mine, to design their perfect piece. Where is your main client base? I don’t avidly search for customers. A lot of contact is by word of mouth and also through Facebook and Instagram. What are the challenges in making your creations known? I much prefer creating to advertising or making my work ‘known’ so I have not come across any real challenges in that respect so far. I found you via an Instagram post. Do you find social media important? Definitely. It really makes my day when I stumble across an amazing designer, outfit or piece of jewellery that I may never have discovered without social media. Pintrest is my favourite out of them all. For my own brand, I think it is just great that people in all parts of the world, who I have never met, can see my work and connect with me through Facebook or Instagram. Do you create pieces other than your beautiful cuffs. For example, have you considered taking those skills and applying them to beautiful beaded handbags? Oh absolutely. Actually, I have made bespoke pieces, including a bag, which I haven’t published pictures of. But yes, I would bead everything if I could. The amount of time each piece takes is the only thing that limits me. Cuffs are definitely my passion though, and I think you can completely change the look of an entire outfit with a perhaps “not so simple” piece on your wrist. Where do you see the future of Lakota Bijoux? Doing bigger, more daring pieces. My to do list includes large collar pieces and jackets. Do you have any words of wisdom to pass on to other designers who want to launch their own business? Focus on the product – it helps to be completely in love, possibly boarding on obsession, with what you do. Everything else will come naturally.